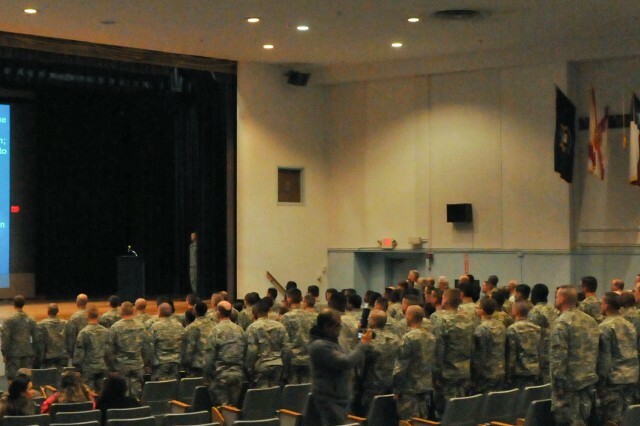 JOINT BASE MCGUIRE-DIX-LAKEHURST, N.J. -- When dozens of Soldiers completed the Basic Leader Course at the Army's Noncommissioned Officer Academy here, they sang about the "wild blue yonder" during their graduation ceremony Jan. 28. They weren't singing the U.S. Air Force Song because of its catchy melody or clever lyrics, but rather in recognition of the two Airmen who were graduating alongside them as part of the academy's first joint-service course. "We need to make our academies at the lowest level not only joint but international," said Command Sgt. Maj. Kimberly Kemper, NCO Academy commandant. "All these missions that we go on for our services are going to be joint, they're all going to be international, so why not start here?" Air Force Staff Sgt. Mario Manago and Senior Airman Jordan Lamb, both members of the 621st Contingency Response Squadron stationed here, became the academy's first non-Army graduates since Kemper started steering the academy in a joint direction after becoming commandant this past summer. "Part of my vision was to invite our partner services here on this base and see if they'd come," explained Kemper, a former instructor at the U.S. Army Sergeants Major Academy. "I met with all the services and said, 'Please send us E-4s and E-5s from your service, we want to share our leadership knowledge with you." The Air Force was first to step forward and fulfill Kemper's request, sending one E-4 and one E-5 to attend the month-long Basic Leader Couse, which focuses on leadership, training and warfighting with an emphasis on how to train, fight and lead at the team-leader level. "Being in an Army school is almost like being in a deployed environment, said Manago. "You have to constantly stay ready and vigilant to go out and do the mission. "It kept me in my tactical mindset, which was kind of limited, but they brought the Soldier out of me," he added. "It's probably one of the greatest learning experiences I've had, especially since we're all one military," said Lamb. "You get to understand how (Soldiers) work, so when you work together it just makes things so much easier." Being stationed here in a joint environment made the experience of attending joint training that much more valuable to these young Airmen. "In air transportation, we actually work with the Army quite a bit," Lamb explained. "We move the Army out, we go to different locations and bring them back home, we have our joint readiness training with them, and we work with them all the time." "Being part of the 621st, we already have a joint mission with the Army," Manago said. "I'm now a liaison to the Army for the Air Force. In whatever capacity I'm working in, I can say, 'Hey, I know that Soldier, I know that Creed, I understand what they're doing, I can now interface with that person." Manago and Lamb had plenty of chances to interface with Soldiers during BLC and were required to meet the same standards as their Army peers. "It was fast-paced, but not so fast that you can't keep up," Lamb said. "I just immediately fell into it and made tons of new friends, and I had great instructors. "Most of it was a challenge, but nothing I couldn't handle," she added with a smile. "Adopt it, learn it, excel in it, and become it," was the advice Manago offered future non-Army students at the academy. "I wasn't trying to compare Air Force to Army -- I was trying to learn how the Army does what it does in their environment." Based on the first joint course's success, Kemper plans to continue to host other service's members at her academy. "I'm still looking for the Navy, I'm still looking for the Marines, I'm still looking for the Coast Guard," she said. "I really just want to be thinking about our youngsters and how we can better prepare them for what's ahead as leaders." For those interested in attending the academy, contact your chain of command.